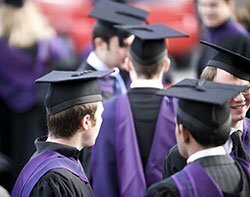 IT graduates are among the least likely students to find a job after leaving university, according to a report by the government's Higher Education Careers Services Unit (HECSU). Unemployment in IT rose to 16.3% this year, an increase of about 2%, compared with an overall average of 8.9% across all industries. Charlie Ball, deputy director of research at HECSU, said one reason could be the high proportion of male students taking the subject, currently 83%. "Men and women approach the labour market in a different way. Men [typically] wait for a job to turn up, whereas women are often more prepared to take something else," he said. "You've got to bear in mind that salaries in IT are relatively high so it can also be worth holding out for," he added. Other reasons for the high unemployment rates could be an oversupply of IT graduates in the market and IT being a course which offers little time for practical work experience, he said. Graduates from mathematics, IT and computing-related degrees have been greatly affected by the employment consequences of the economic downturn, said the body. This is because traditionally graduates of these subjects have favoured careers in business, finance and IT - areas that have recently experienced large falls in recruitment, it said. However, recent research indicates that the top recruiters in these sectors are set to recover some lost vacancies in 2010 as they increase graduate opportunities by 18% since 2009.